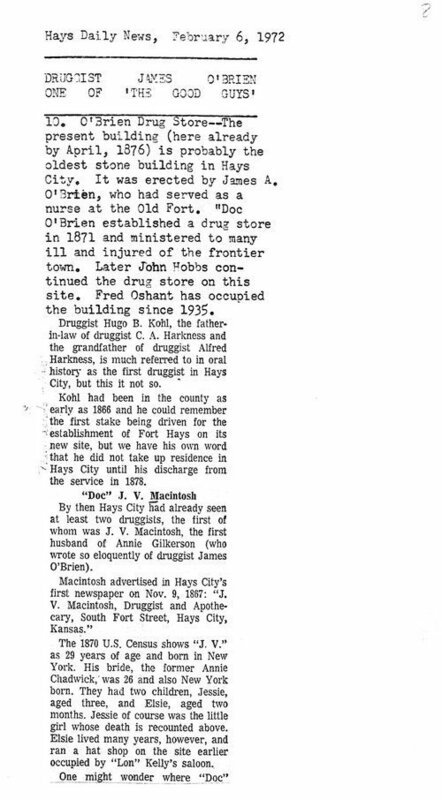 These images show news clippings of the article titled "Druggist James O'Brien one of 'the good guys,' " published in the Hays Daily News of Hays, Kansas, and collected in Hays Historical Clippings by Blaine E. Burkey. The article describes the history of several of the early pharmacists in Hays and nearby towns, and O'Brien's establishment of the first drug store in Hays in 1871. Druggists mentioned in the article include: James A. O'Brien, John Hobbs, Fred Oshant, Hugo B. Kohl, C. A. Harkness, Alfred Harkness, J. V. Macintosh, Edward Polly, Frank F. Corlis, T. B. Yates, J. H. Middlekauf, W. J. Lippard, D. C. Taylor, Watson Zeigler, C. L. Dixon, R. M. Shelby, W. E. Cass, F. W. Garwood, J. G. Michaelis, C. M. Lewis, S. J. Holman, Pat Conlan, John F. Hammonds, and Nathaniel Kidd.